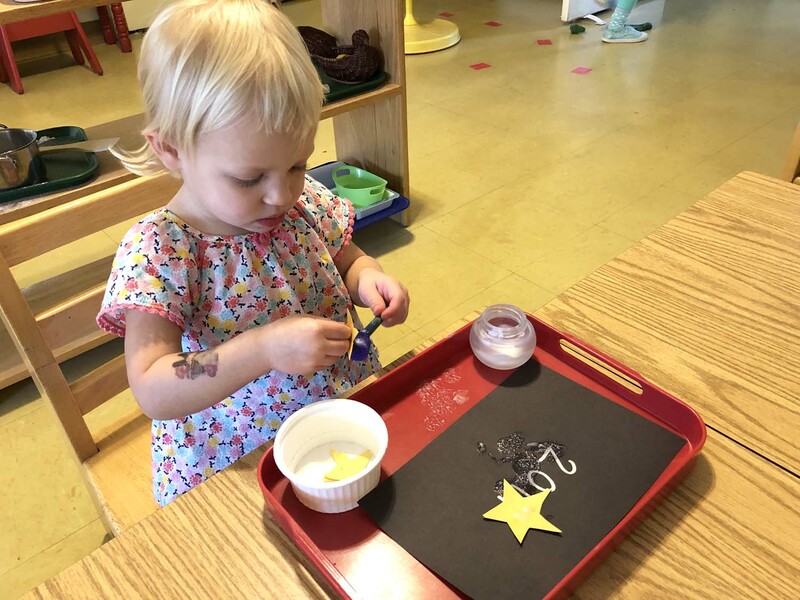 Ms. Johanna added a 2019 activity with stars to welcome her students back into the classroom and the new year. We were amazed to see all of the children get right back into the groove of the school day on Monday! They were excited to see each other! We witnessed lots of hugs, and the children calling out their friends’ names. In the classroom, everyone went straight to explore the work. Some went to new (to them) works, and some of them went to all-time favorites (such as the train with the track). Even though a few children fussed for a moment once they arrived, that soon melted away as the sun rose toward 9 a.m., and they jumped in to play. January features “Children of the World” (activities explained below), weather, snow and things that go with snow, such as mittens, polar animals, snowflakes, snowmen, and fake snow in the sensory bin. We have books about polar bears, and one that gives the Spanish verbs for what polar bears like to do, such as sleeping, sliding, running, walking, swimming and such. 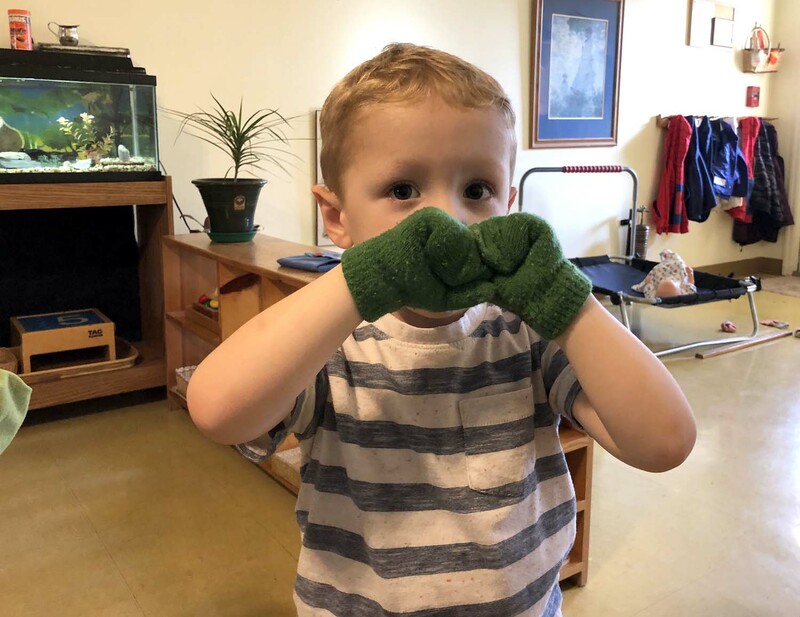 The toddlers have mittens they can put on in Ms. Johanna’s classroom. For weather, we have snowflake, rain, and sun stamps for painting. We also have felt weather representatives, such as raindrops, white clouds, gray rain clouds, a lightning bolt, and a blowing face that represents wind. We have a magnetic boy that can be dressed in firefighter clothes, carpenter clothes or police officer clothes. We also have little cards to place in slots that have a picture of an isolated body part, such as hand, foot, mouth, nose, eye, ear and belly button. The toddlers are learning about the number 5 this month. 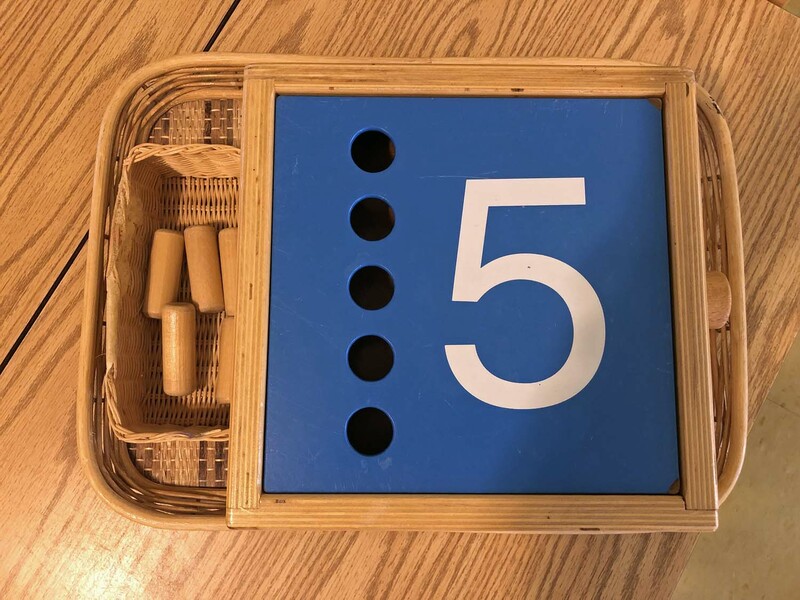 In the drop box is the number five, and five pegs to place in the holes (symbol, quantity and the combination of the two). Our school has a lot going on in January. As you probably already saw in the school newsletter, I’m going to offer a three-week Positive Discipline series. I’m excited to facilitate Positive Discipline workshops to help us gain insight into the inner life of the child, glean new tools that will empower you as a parent, while inviting cooperation, self-discipline, responsibility and problem-solving skills in the child. Feb. 9: Annual Wine Down & Silent Auction, 6-9:30 p.m. Along came a bunny, and what do you suppose. Ate the snowman’s carrot nose… nibble, nibble, crunch. Fingers all together, this is the song we sing in mitten weather. in and out she blows about trying to get in. These little children are asking you, to please come out so they can play with you. Pitter, patter, drip, drip, drop. How I wish the rain would stop. Will the sun come out today? So we can go out to play?